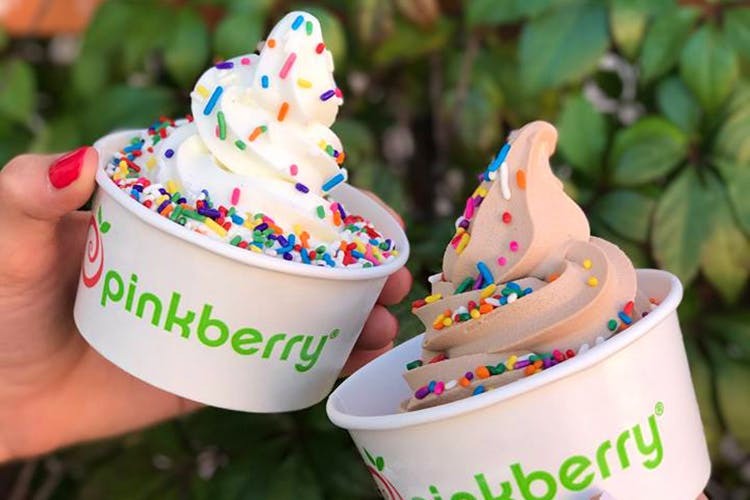 Experiment with flavours and get a healthy fix of cold, sweet treats of frozen yogurt, lassis and milkshakes at PinkBerry, a handcrafted yogurt bar. If your solution to everything, be it the summer heat, a break up, a stressful day or mere boredom, is to dig in to a tub of ice cream but you also know its time to watch your diet, Frozen Yoghurt, or FroYo as the cool kids call it, is your saviour. And PinkBerry – a handcrafted yogurt bar is where you can get yourself a bowl or two of this delight! They have six basic frozen yogurt flavours – original, pomegranate, chocolate, mango, green apple and salted caramel. We love the crisp taste of the green apple and the unique salted caramel one, but most love the mango. You can make your own bowl too, if ready made isn’t your thing. Choose your flavour, add your own toppings of coconut shavings, red velvet cake, fruit, berries, sprinkles, and a lot more interesting options. You could also take their mix and match combinations for fresh yogurt such as Khatta Meetha, tomato basil, chiknoo date granola and humour your taste buds. If you’re more of a beverage person, try out the fresh yogurt lassis which comes in mango, chikoo-dates and pineapple-coconut flavours for just INR 120, or the frozen shakes which is blended with frozen yogurt in pomegranate, chocolate banana and salted caramel flavours for INR 175. The frozen yogurt is starts with INR 75 for a small bowl (INR 100 with toppings) and goes up to INR 145 for a large bowl (INR 195 with toppings). A little birdie told us that they’re coming out with a new flavour where lemonade will meet matcha, so watch out for it!